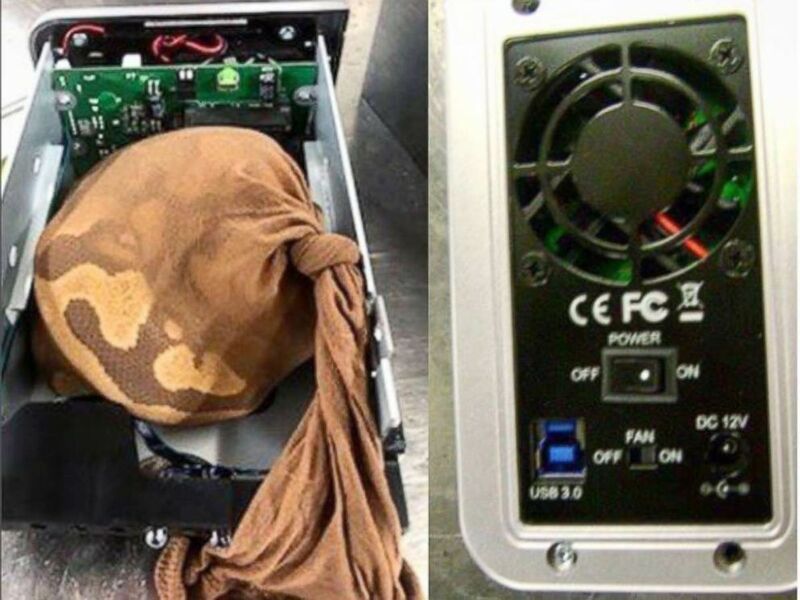 Airport security agents stopped a woman from boarding a plane with a python wrapped in a nylon stocking concealed in a computer hard drive Sunday. The Transportation Security Administration (TSA) said its agents stopped a real-life version of "Snakes on a Plane" from happening after an agent noticed the ball python. "Agent Neville Flynn would be extremely proud of our officers at the Miami International Airport (MIA). You see, Agent Flynn has HAD IT with snakes on planes, and our officers prevented a young Ball Python from flying the friendly skies this past Sunday," the TSA wrote on Instagram, referencing a line from the 2006 film. TSA discovered a python inside an external hard drive when a woman was going through security at Miami's airport. "A traveler on her way to the Grantley Adams International Airport (BGI) in Barbados attempted to smuggle the snakelet inside of an external hard drive packed in her checked bag. If you think airplane seats can feel constricting, imagine how this little guy felt! Talk about bad memories!" the TSA continued. "While the python itself posed no danger to anyone on the aircraft, an organic item concealed inside electronics raises security concerns, which is why our officers took a closer look." "The U.S. Fish & Wildlife Service ( @USFWS ) was notified. They responded and took possession of the snake and cited the traveler. Both the traveler and the snake missed their flight," the TSA added. "Conversationally, this python had not gone full monty. It was wearing a nylon stocking."